A City player really did come onto the pitch with a Monty Python Mr Gumby style handkerchief on his head in a top flight English game. Percy Sands won the toss in this season opener and decided to play facing the blistering sun, the match being played in arguably the hottest conditions ever played in a football game in England. After an even first half-hour Peter Kyle scored, having been put in by David Neave. Five minutes later Irvine Thornley left the pitch, and was soon followed by Jimmy Conlin, both victims of the intense heat, which enabled Tim Coleman to double the lead, and the teams went in for a well-earned rest. After an extended break of eighteen minutes the teams re-appeared, but City only had nine men as the two sunstroke victims were still laid out in the dressing room. Conlin came back briefly with a handkerchief on his head, but then George Dorsett keeled over. At this point, with only eight City men on the pitch, the referee consulted with the officials and the two captains, and the decision to continue was made. Dorsett returned, making a full recovery, and scored with a great shot to reduce the arrears, but then Tommy Kelso left the pitch and the game was again halted, long enough for his return. Additionally, Bob Grieve who had been suffering from a cold all week was unable to take much of an active part in the second half. As the game wore on Arsenal netted twice more, with Kyle scoring his second and Charlie Satterthwaite also getting on the score sheet. But City’s players, many prostrate on the ground, could not cope with the heat and they finished the game with only six players. Manchester City: F Davies, J Christie, T Kelso, A Steel, J Buchan, G Dorsett, G Stewart, I Thornley, R Grieve, W Jones, J Conlin. Woolwich Arsenal: J Ashcroft, A Cross, J Sharp, J Bigden, P Sands, R McEachrane, W Garbutt, J Coleman, P Kyle, C Satterthwaite, D Neave. This match saw temperatures of 91°F (33°C) in the shade and 125°F (52°C) in the sun, as the whole country suffered in the excessive heat. It was so hot that referees all over the country were allowed to officiate without their jackets! Authorities arranged for water to be passed around the watching crowds at many matches to prevent dehydration. 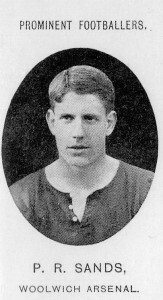 Percy Sands, a schoolmaster and the Arsenal captain, had recently turned professional, and this was his first game as a paid employee of Arsenal rather than playing as an amateur. 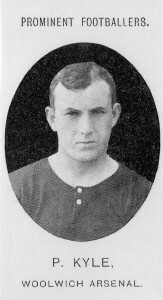 This match was Peter Kyle’s debut for Woolwich Arsenal having recently signed from Tottenham Hotspur. Five players were making their debut for City, they were Frank Davies, Tommy Kelso, George Stewart, Bob Grieve and Jimmy Conlin. Manchester City were punished by the FA for awarding players bonuses above the stipulated ceiling of £4. Consequently, at the start of the 1906–07 season they were depleted of many players owing to the wholesale suspensions by the FA for their disregard of the authority’s rules. This was the reason why at the start of the season they had an experimental team many of whom were making their debut. Two days after this match a dispirited Manchester City side went away to Goodison Park and lost 9-1 to Everton, though only Irvine Thornley was missing from the team being unable to recover sufficiently from the weekend game. Just over a month later, on Saturday 6 October, Woolwich Arsenal topped the First Division table for the first time ever after beating Liverpool. 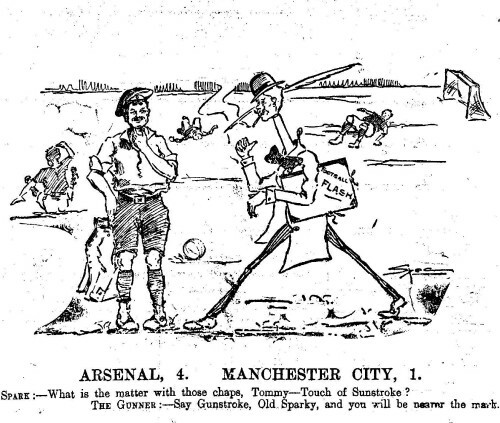 At the end of the season Woolwich Arsenal finished 7th in the First Division, while Manchester City ended up 17th. This season we’ve been asked to write a regular page in the official Arsenal programme based on a classic match featuring the opponents for each game we play in. Programme editor Andy Exley has kindly given us permission to reproduce the match reports on our blog. We will also be including additional material that didn’t make the final edit of the programme. If you can’t get to The Emirates, the programme is available on iPad and iPod for a bargain 69 pence per issue.